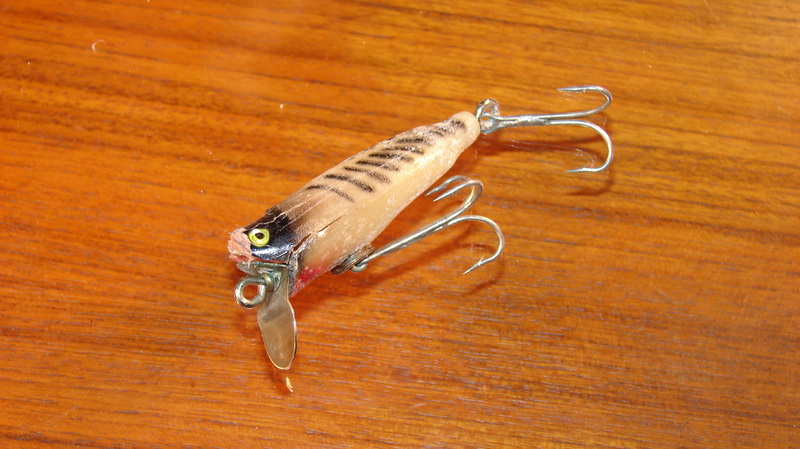 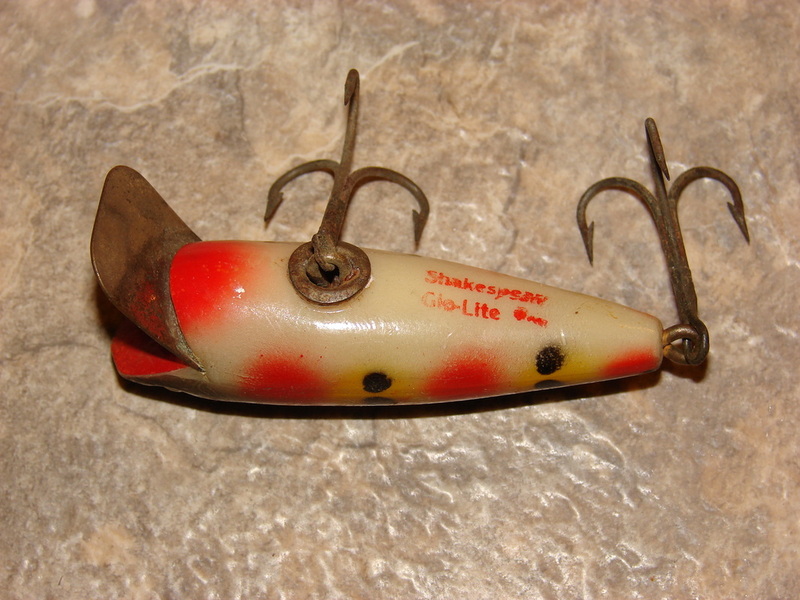 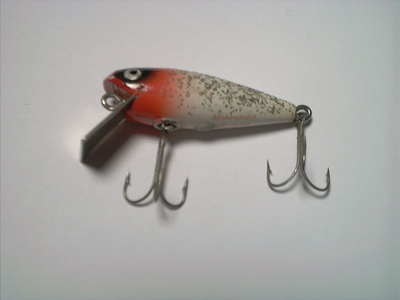 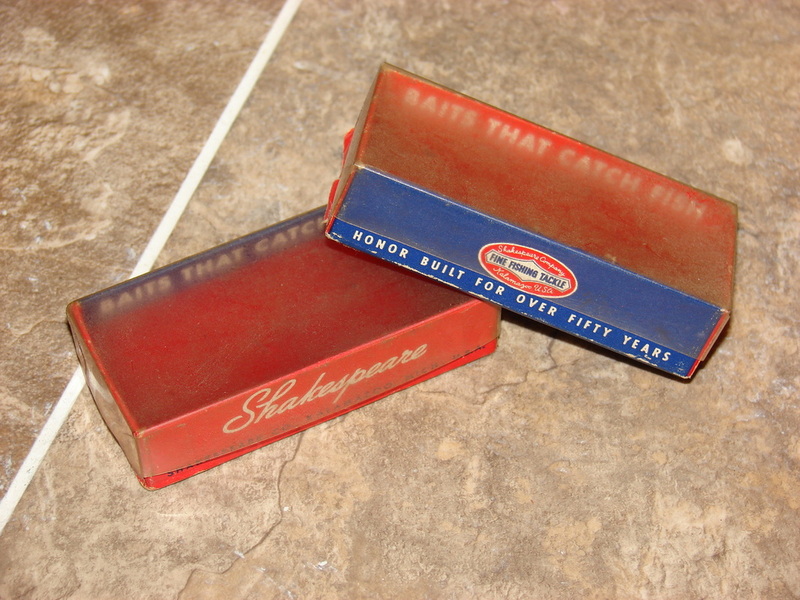 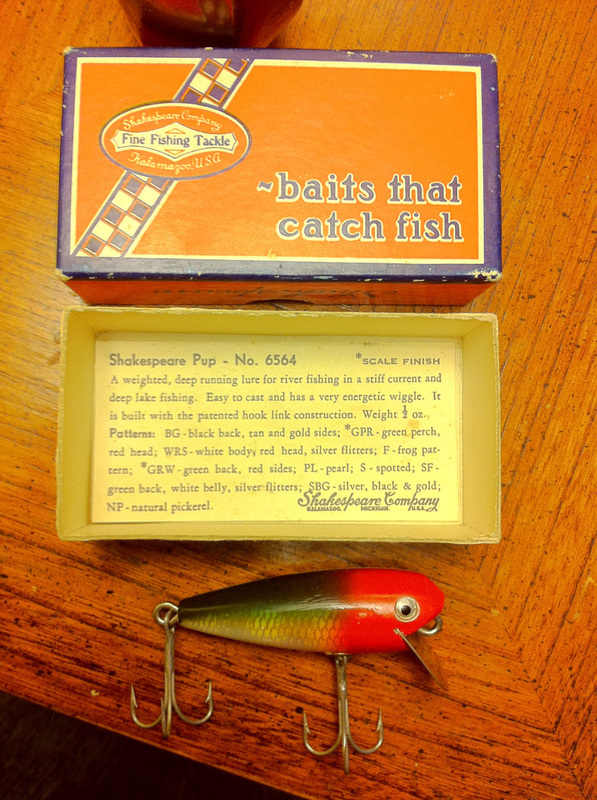 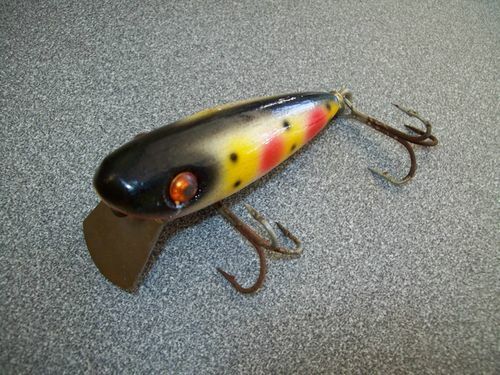 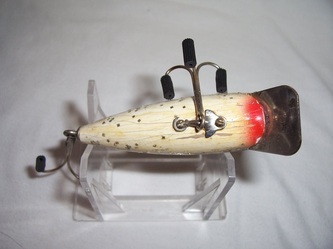 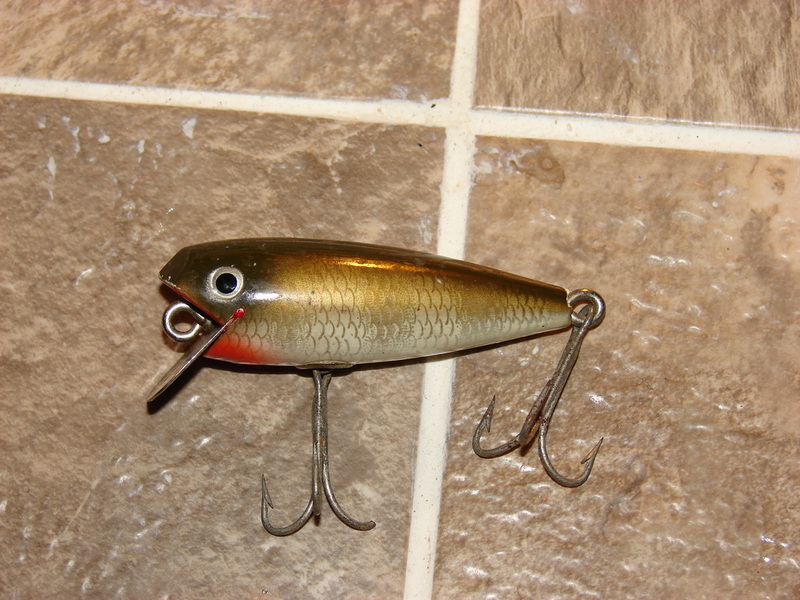 The Shakepeare River Pup was introduced in 1934 and remained in production into the early 1950's, shortly after Shakespeares acquisition by The Creek Chub Bait Co. Pups were produced in Hong Kong during the time period when Shakespeare baits were being produced overseas. 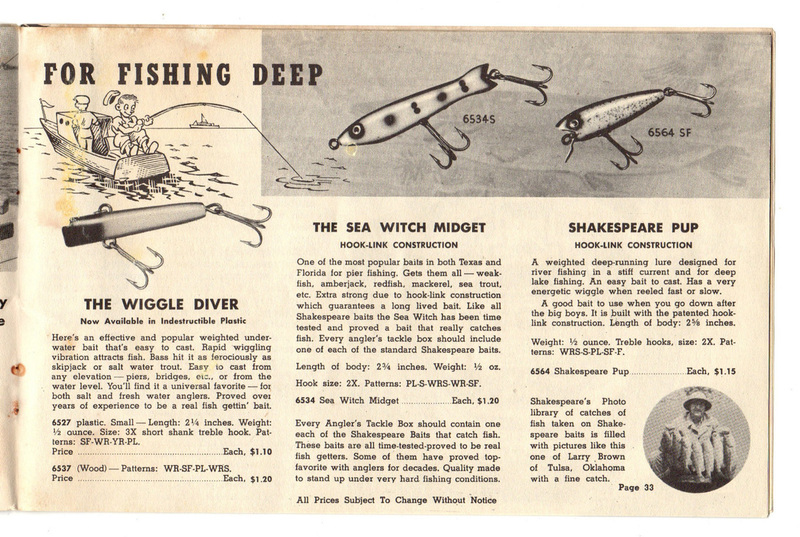 I personally do not collect these so none will be discussed in detail here. 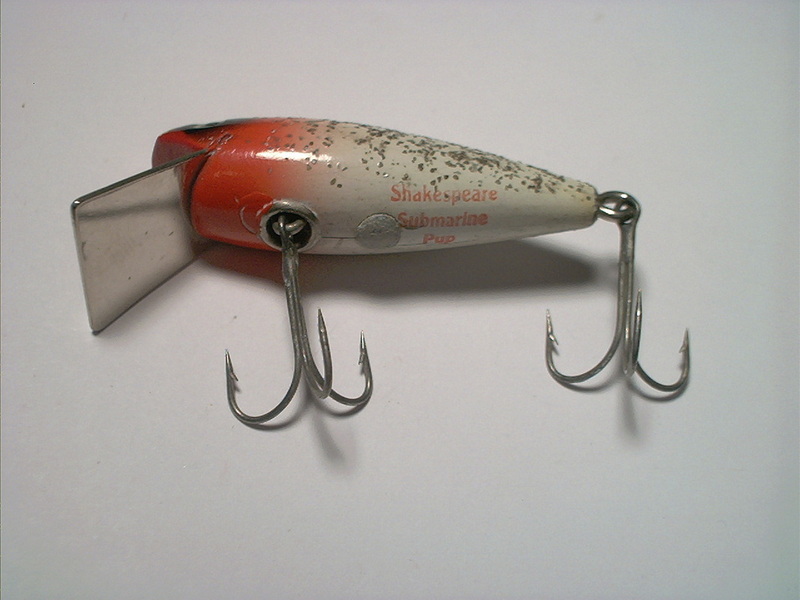 These were produced in the 60"s and 70's and sported surface hook rigging, plastic eyes and are clearly marked "Shakespeare Hong Kong on the belly. 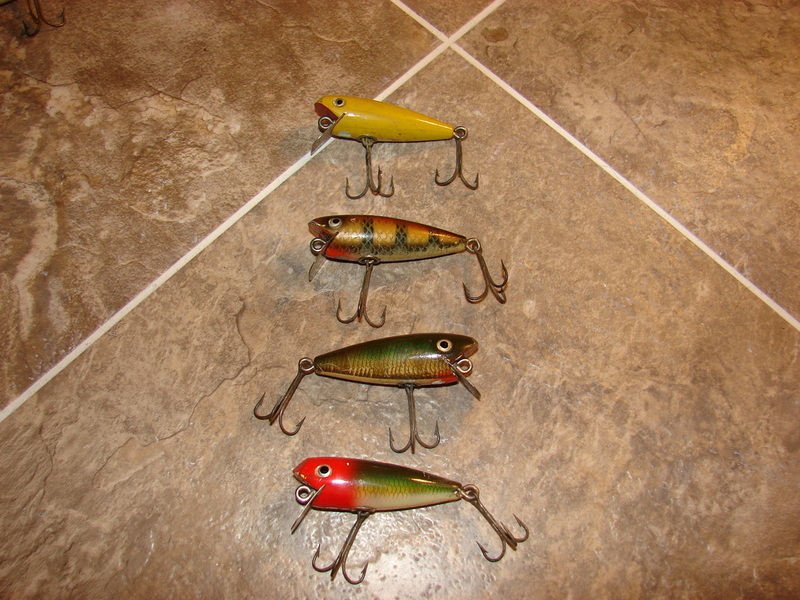 an example of these later pups is provided below. 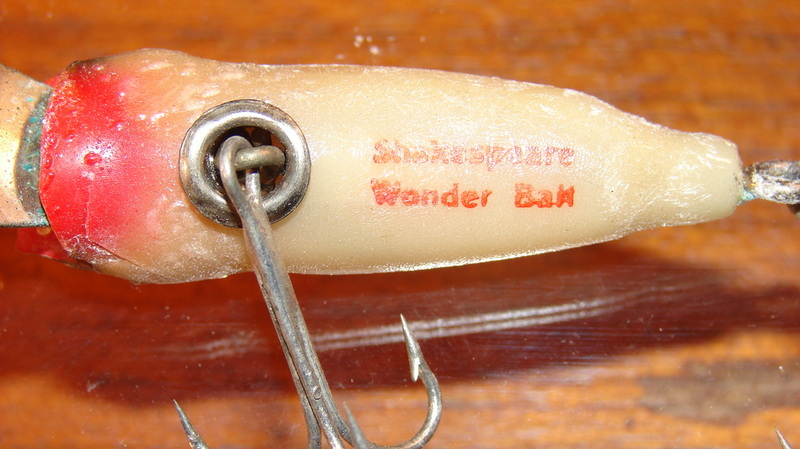 The model number assigned to this bait is 6564 and was catalogued in a handful of patterns yet was produced in quite a few uncatalogued patterns. 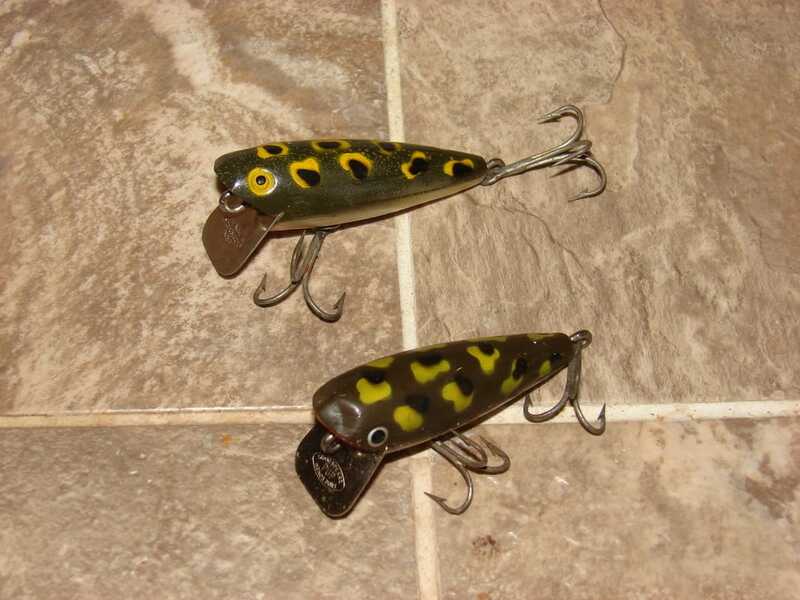 The River pup and glo lite pup measure 2 5/8" with a weight of 1/2oz. 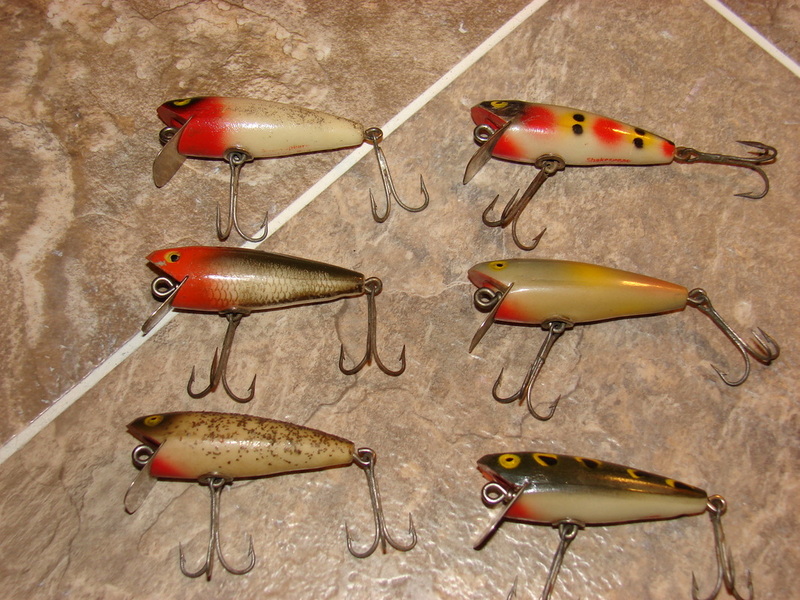 Cataloged colors include Rainbow, pearl, spotted (strawberry spot, Red Head/white/silver flitters, Frog, Silver Flitter, Yellow, Green Perch/Red Head, Scale Finish. 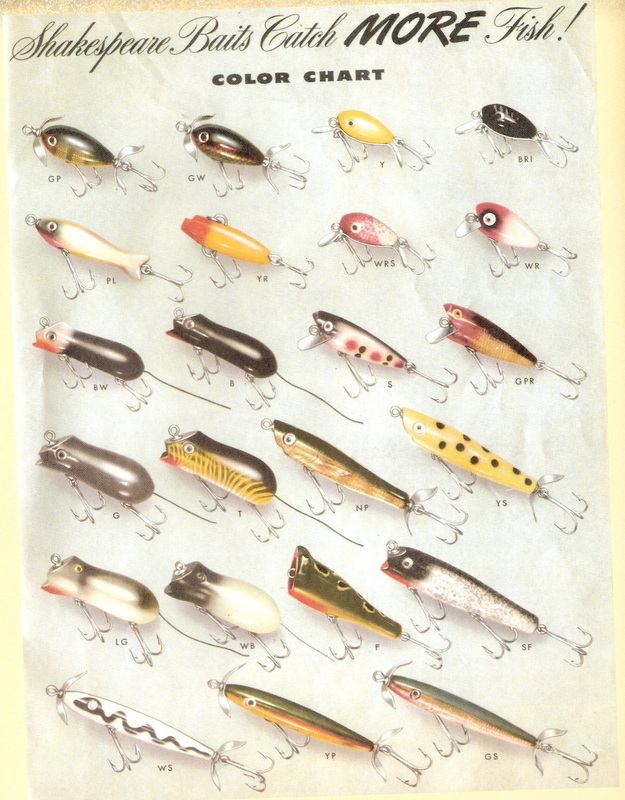 I'm not exactly sure of all the cataloged patterns at this time but the aforementioned patterns are all very common. 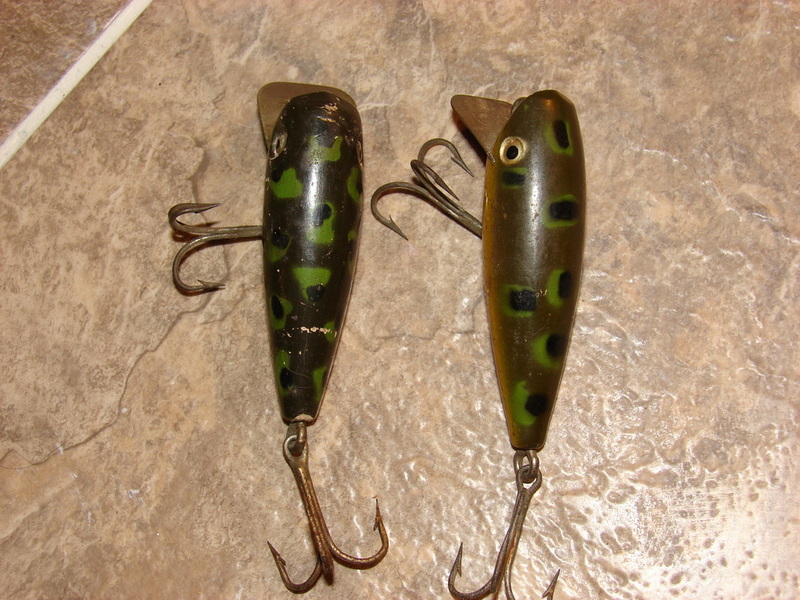 As will be shown in the photos below, many patterns besides the known cataloged patterns were made. 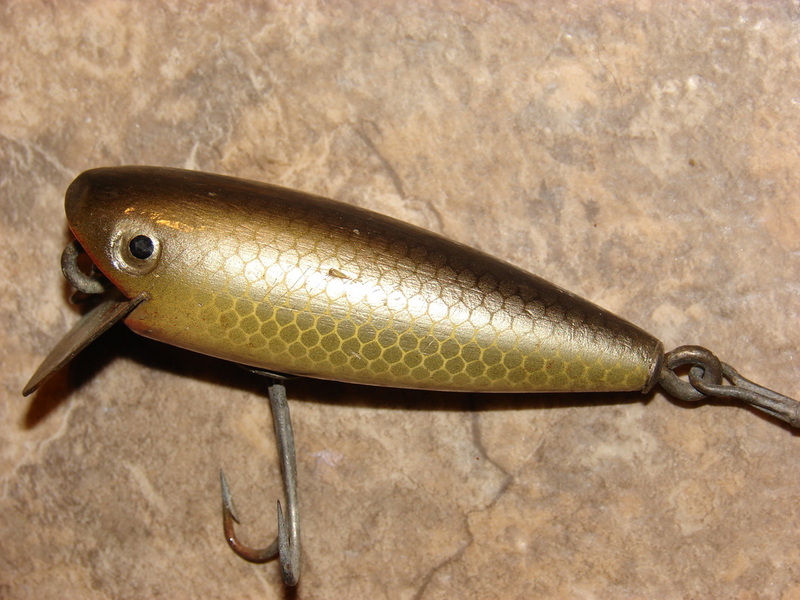 The earliest models had a slimmer, notched lip with the line tie going through thenotched lip thus holding the lip in place. The lip was also slightly bent. The body of the early models appears slightly slimmer with a more rounded/pointed head. 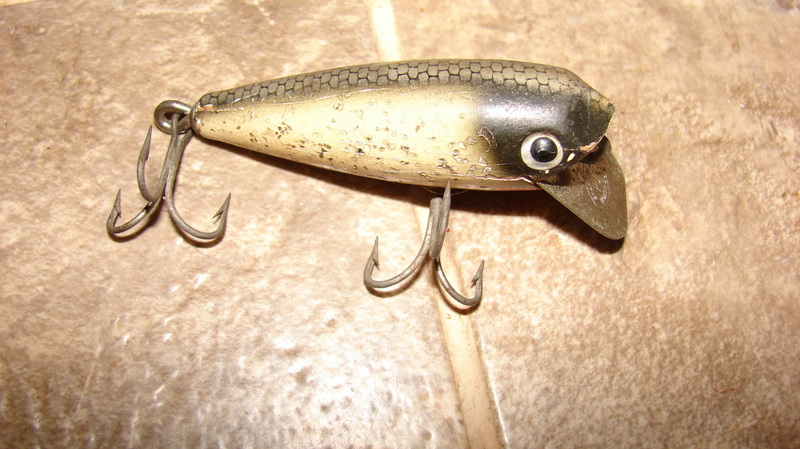 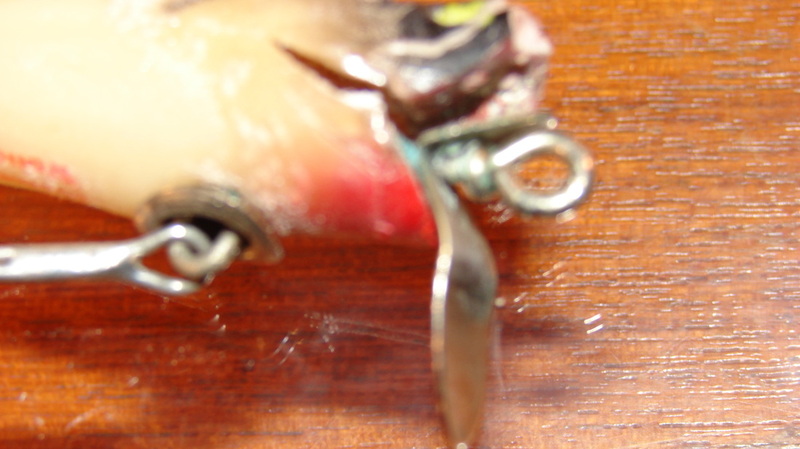 The later baits had a bore blunt nose with the diving lip being straight, not notched and inserted into the body of the bait. The lips are stamped with the Shakespeare Honor Built logo All River Pups of this era (1934 to the early 1950s) have the Shakespeare "Hook Link" hook fasteners which is basically a metal loop which passes through the cup and connects to the line tie screw. 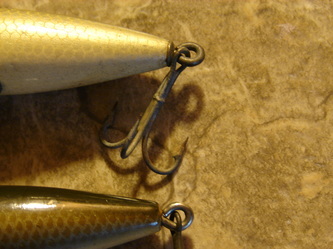 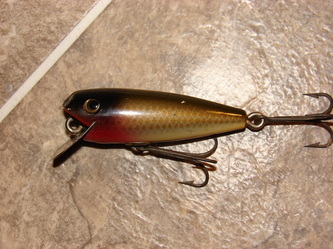 A single belly weight is located in front of the belly hook. 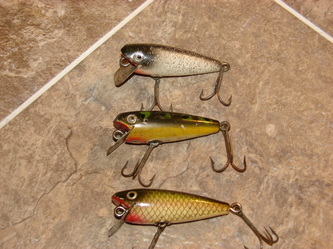 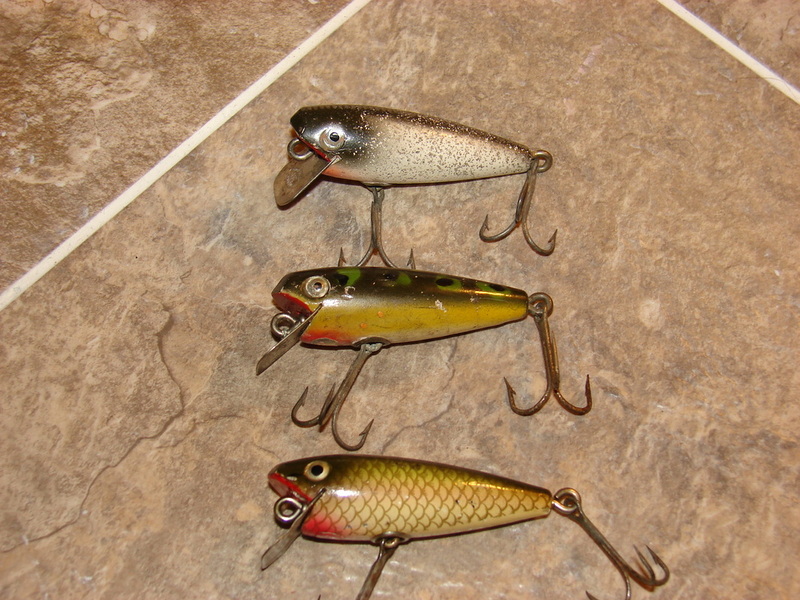 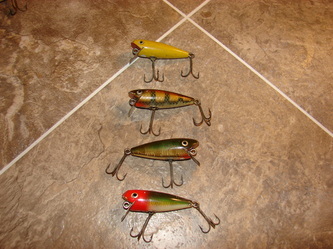 Some baits, as showed below, had a tail cap on the rear hook hanger. At this time, I'm unsure when this was featured but not many of my baits have this. 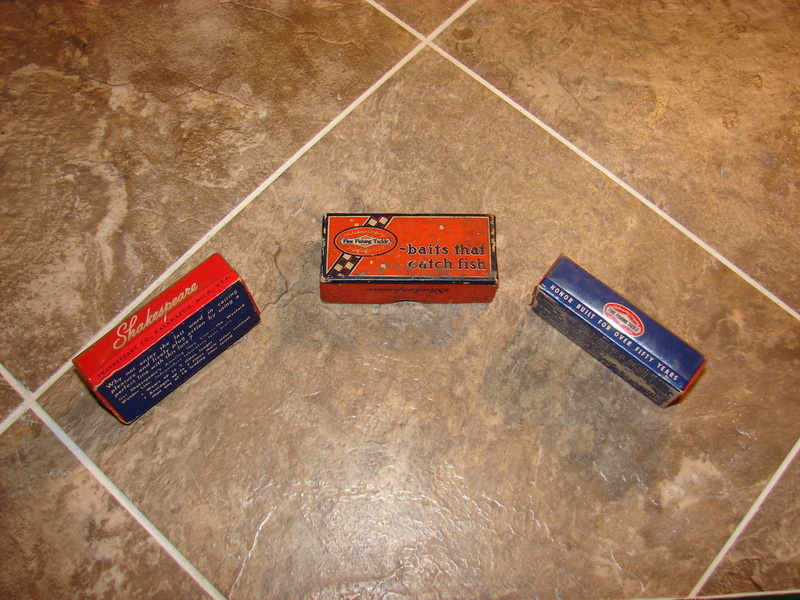 Earlier Pups came in a cardboard box as pictured below with the eventual transition to a plastic top/cardboard bottom box also shown below. 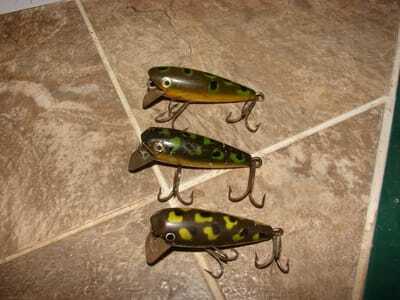 The pictures below can be "clicked" on to enlarge the photo and reveal additional info regarding the specific bait and color. 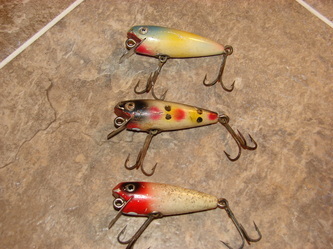 Silver Flitter, Pearl, Frog and Spotted (strawberry spot). 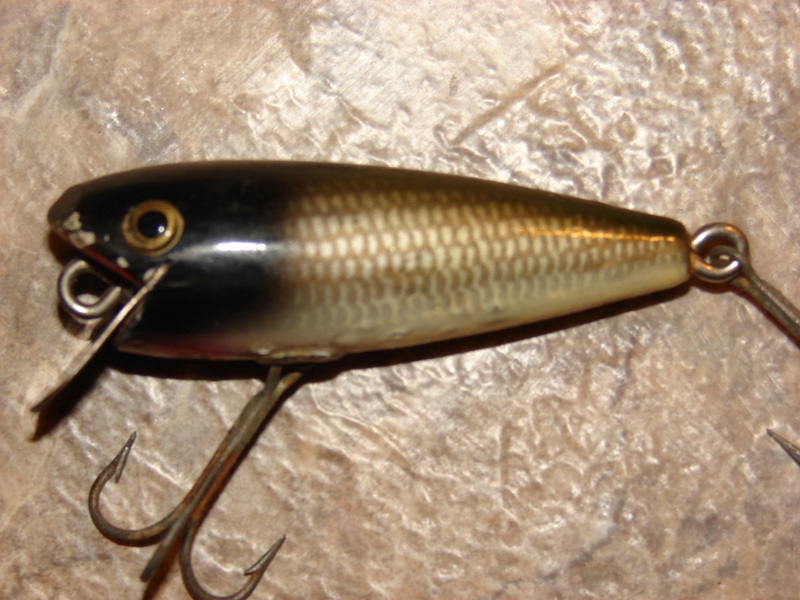 Although I have never seen one, I have been informed that this bait was also offered in a black with white ribs/shore minnow pattern. 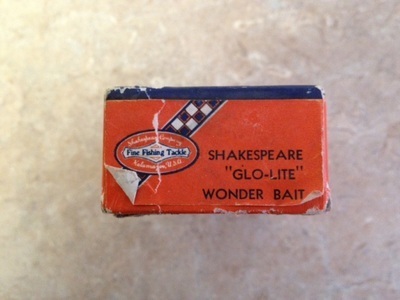 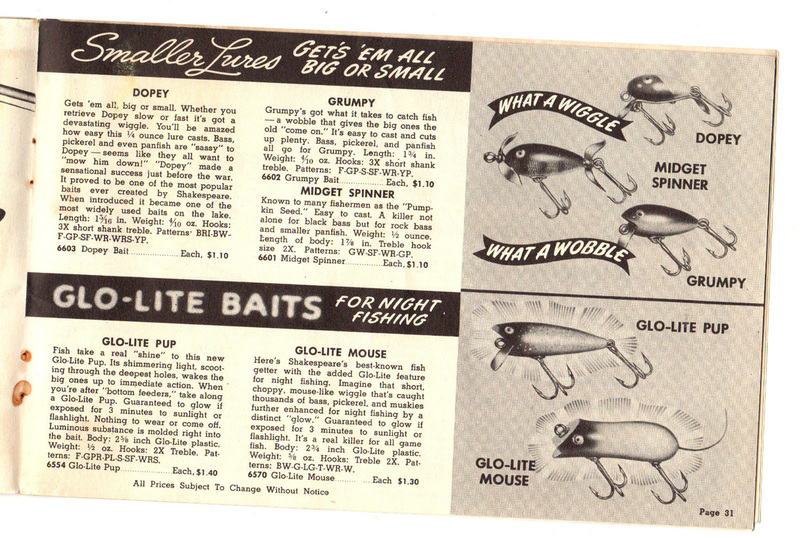 The Shakespeare "Glo-lite" Wonder Bait has not been found in any Shakespeare catalogs. It appears that a model number was never assigned as no boxes I have seen have a model number. As shown below, the bait is molded, solid plastic, basically identical to the glo lite pups yet is clearly marked on the bottom "Wonder Bait". 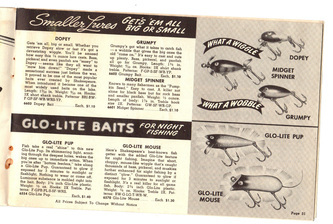 Like the glo lite pups, it sports Hook Link hardware. 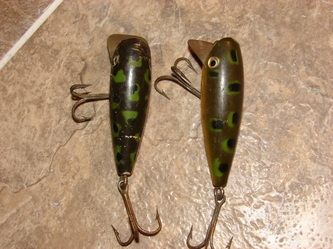 The only difference, besides the markings, is that it has an unmarked lip. 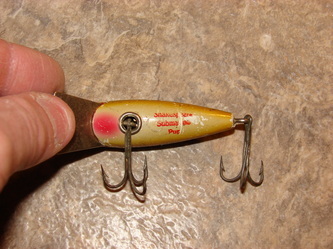 The lip is identical to those featured on very early wood River Pups which has a slight bend or "step" on it. 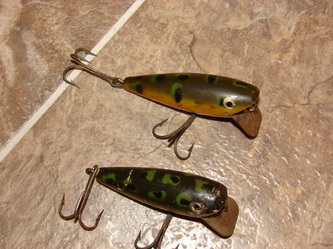 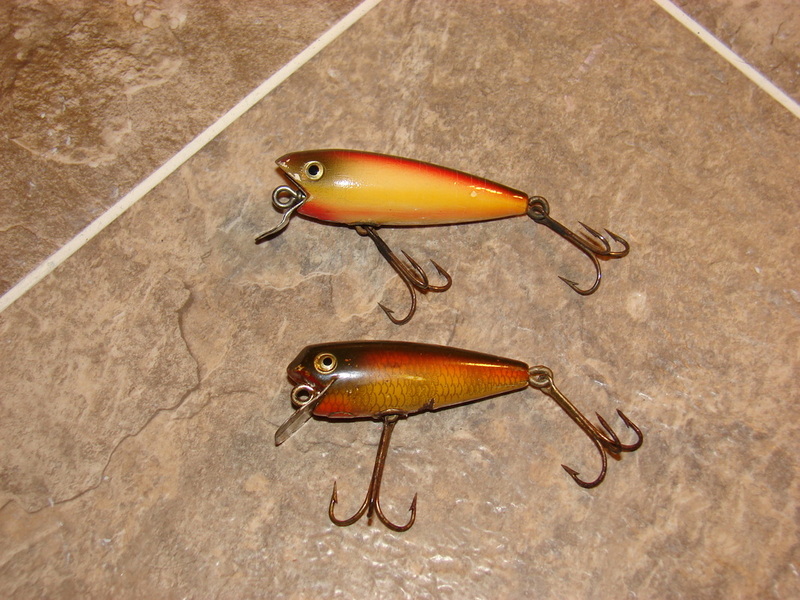 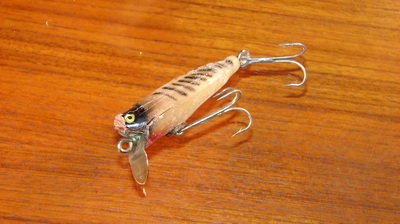 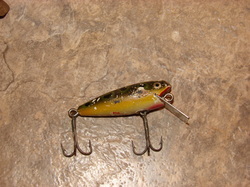 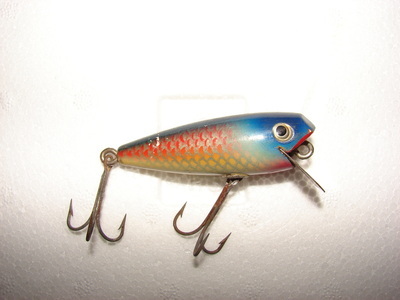 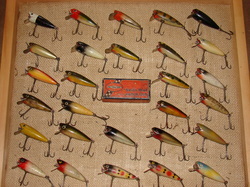 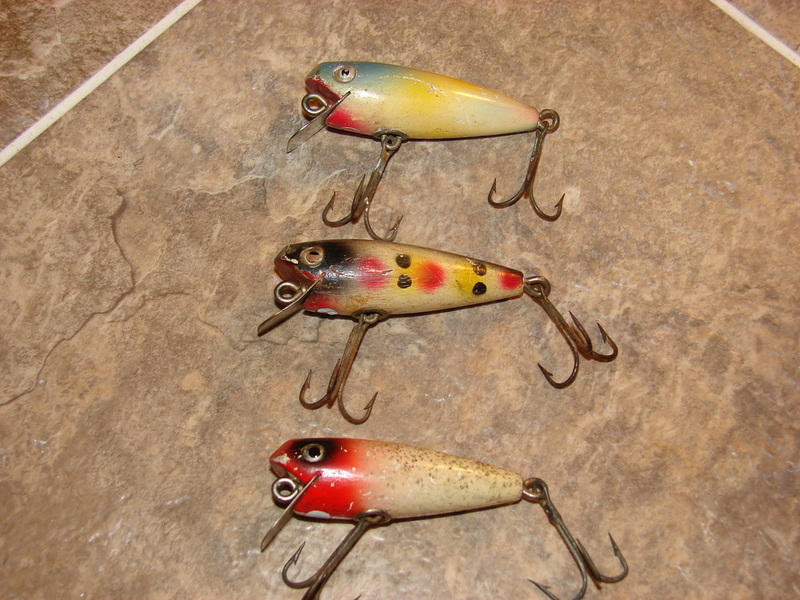 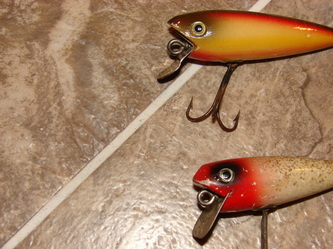 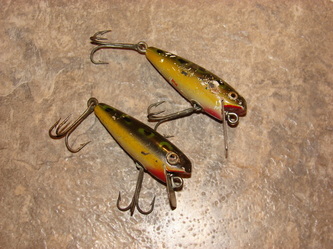 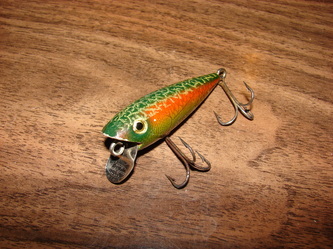 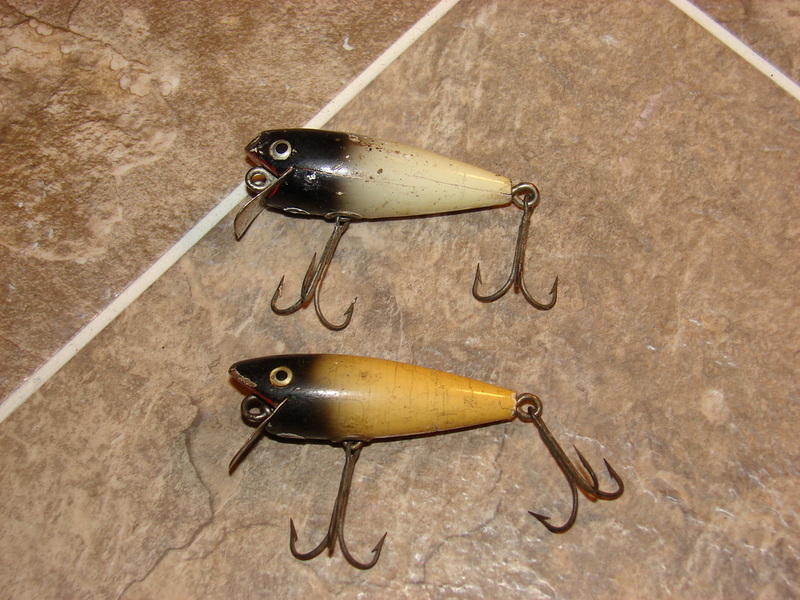 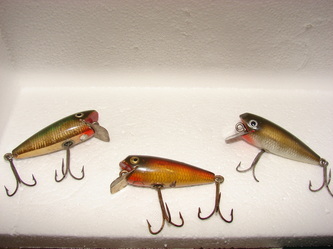 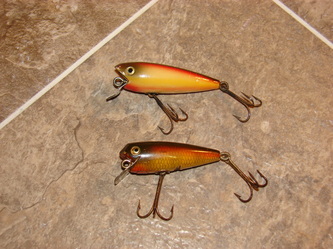 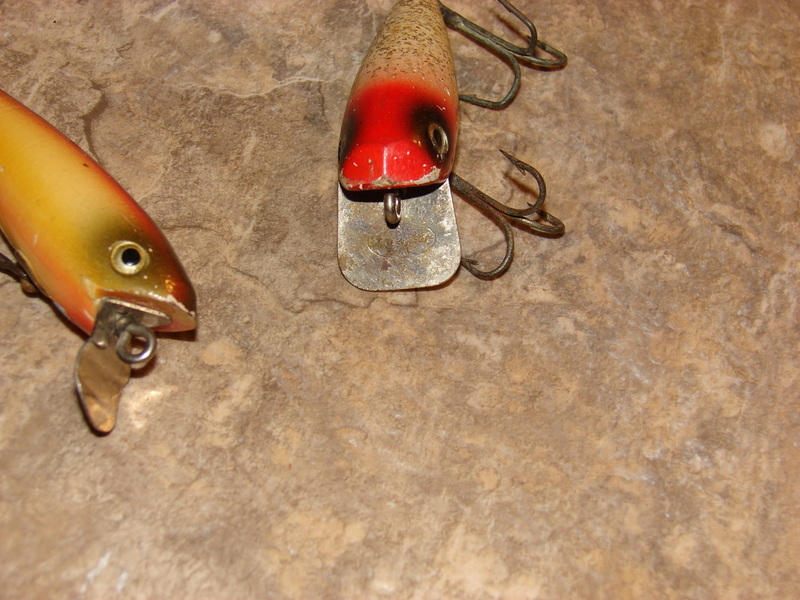 These baits were made of early, unstable plastic which, as with other early plastics, broke down and shrunk over time. 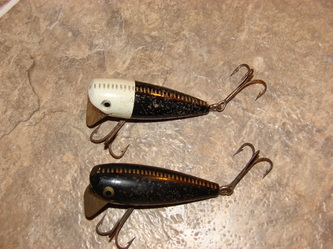 I'm unsure as to what color patterns this bait was offered in as I have only seen a few of these and all were in this white/black ribs pattern similar to color code WRI commonly seen on Shakespeare Dopeys. 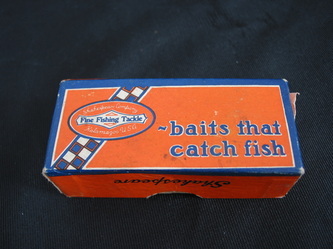 The only boxes I have seen are not marked with numbers or colors. 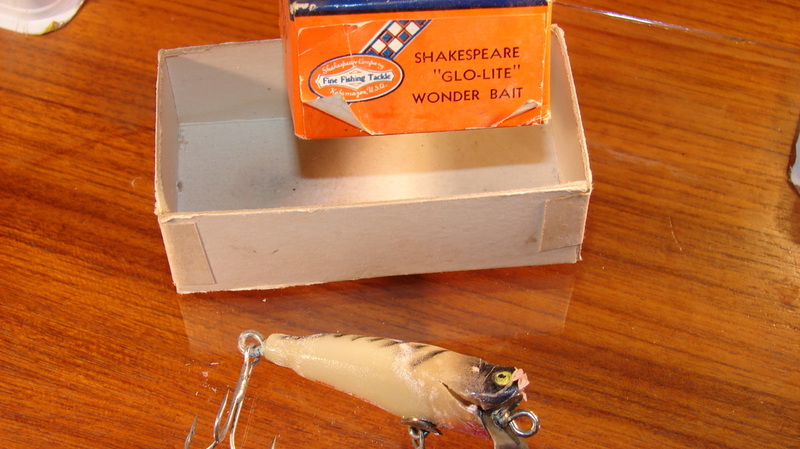 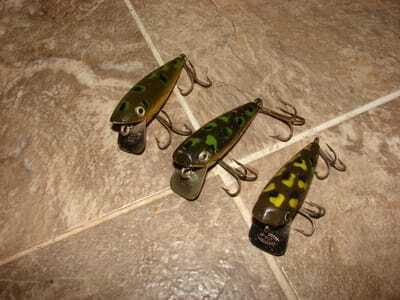 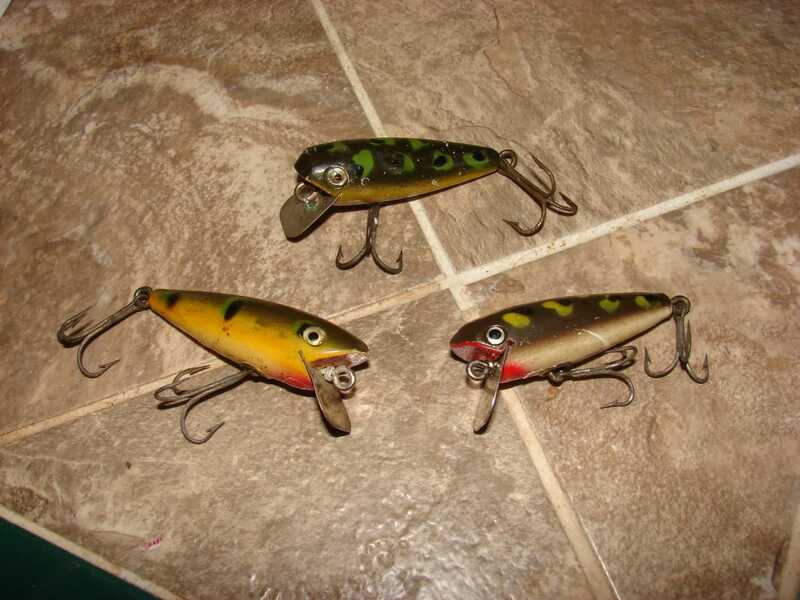 In my opinion, these baits were the precursor to the glo lite Pups since they use the earlier River Pup lip, made before the newer straight lips were introduced. 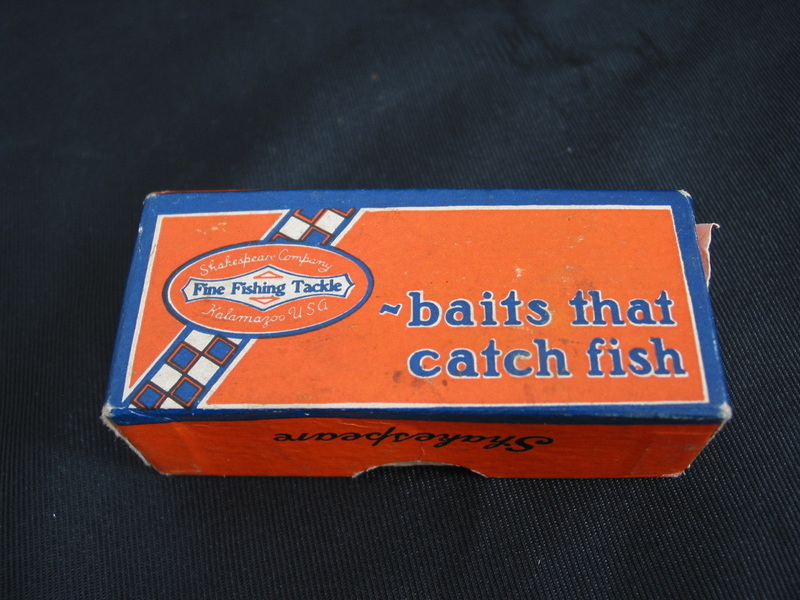 Another possibility is that these were made for a specific wholesaler/retailer as a trade type bait. 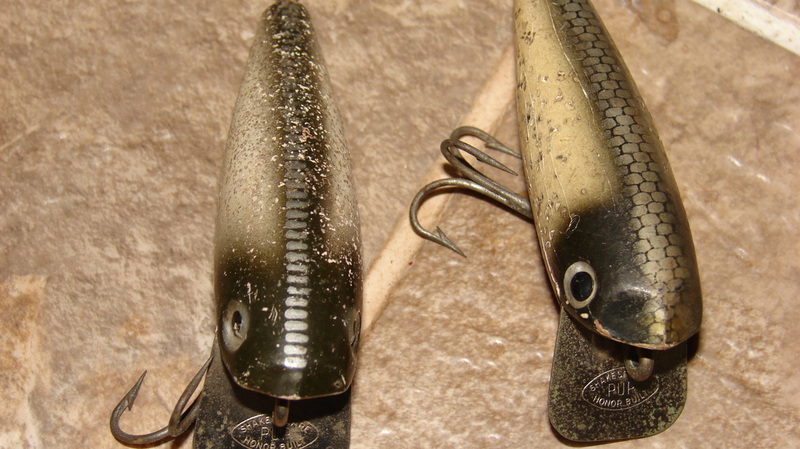 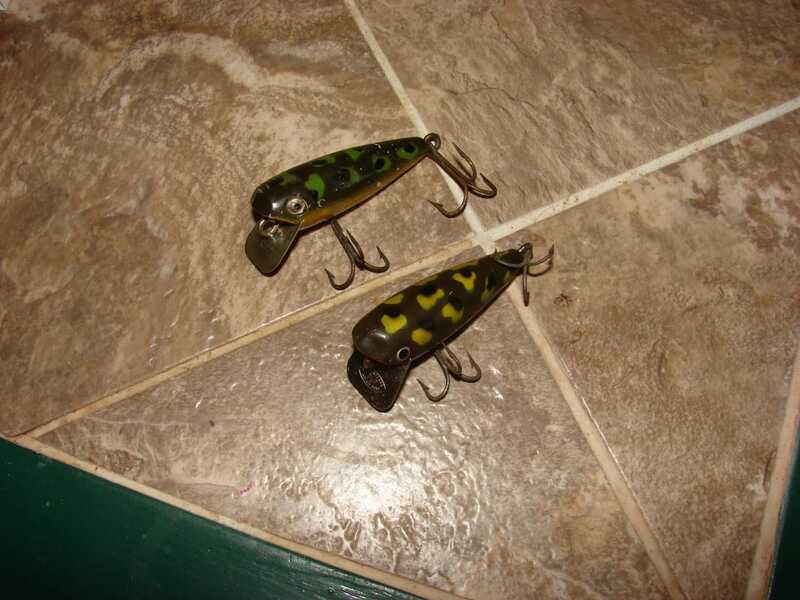 Whatever the case, these Wonder Baits are extremely tough to find. Any info on these is greatly appreciated. 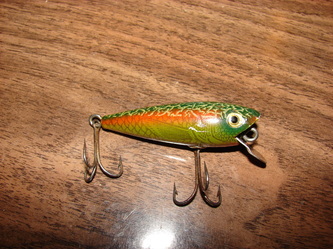 Pictured below is the only one I've been able to find. The bait pictured below is a Submarine Pup. 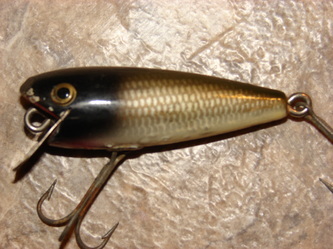 It is the same body as a River Pup but sports an extra long diving lip attached in the same manor of the River Pup as well as an extra belly weight. At 3/4 oz, it is heavier than the River Pup. 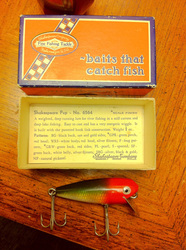 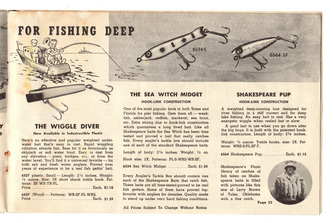 This bait was catalogued only in 1942 and is very tough to find. 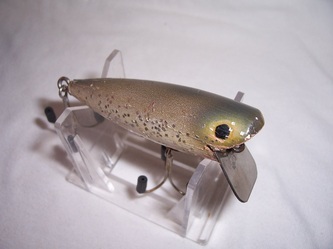 The model number assigned to the Submarine Pup is 6544 and was cataloged in 5 colors: Frog,Green perch/RH, Spotted, Silver Flitter and Red Head/White/silver flitter. 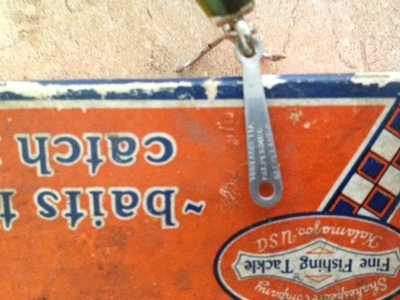 As seen, it is marked as such on the belly. Larry Nicholson has once again provided some great insight to this bait. 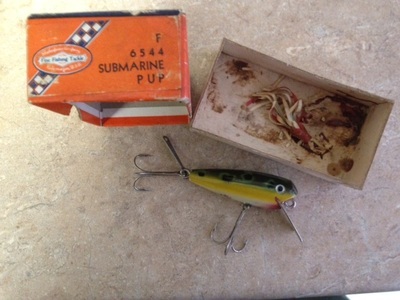 Pictured below is an image of a Submarine Pup in the box. 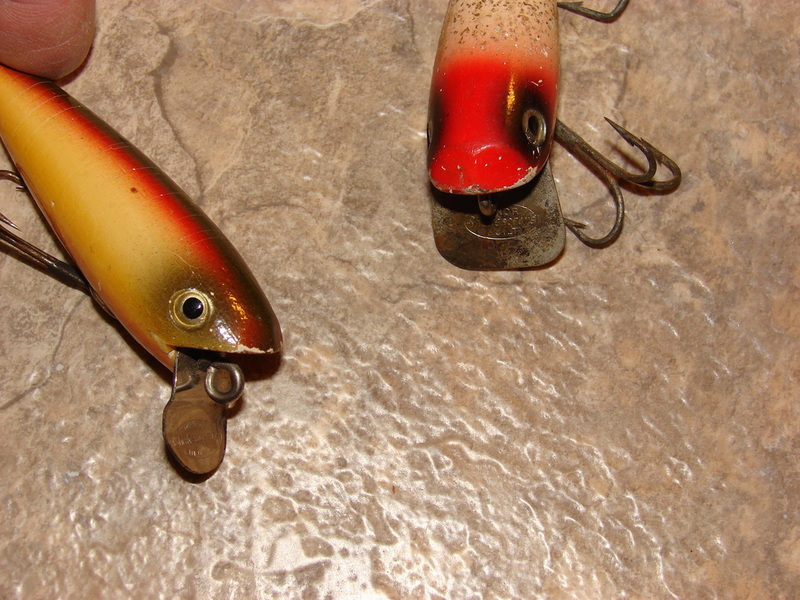 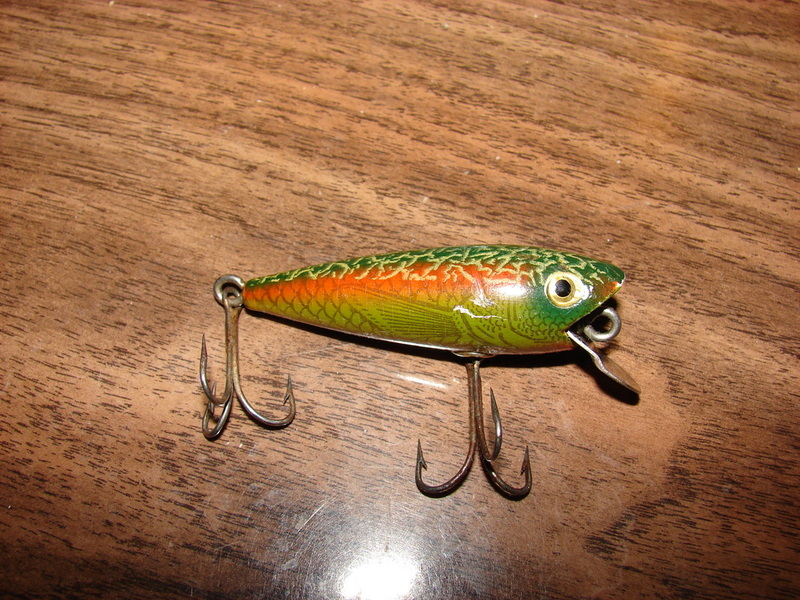 According to Larry, many of these baits came equipped with a rubber skirt with an attachment "hanger" located on the rear screw eye. Check out the photos below.